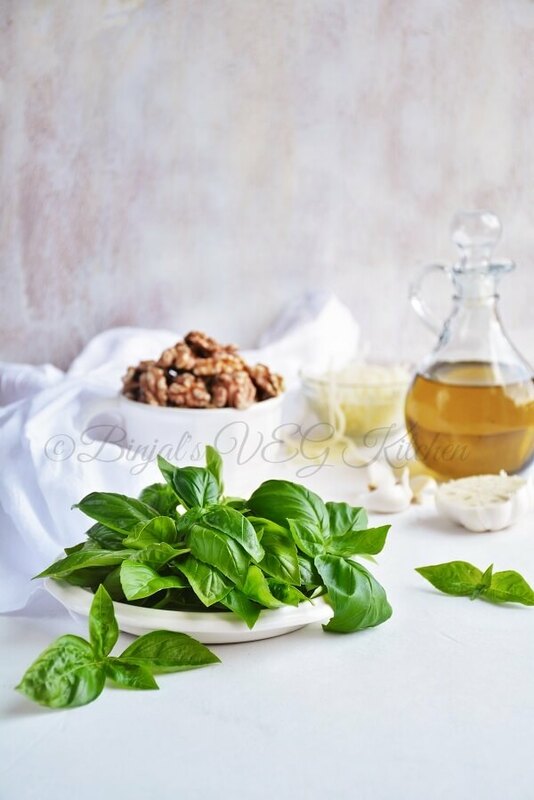 Basil Walnut Pesto is a perfect Vegetarian recipe. Basil Walnut Pesto is made with a few simple ingredients and Basil Walnut Pesto is packed full of flavor. This is a classic recipe for Italian basil pesto. The only difference is that I use walnuts instead of more traditional pine nuts. This is my favorite pesto recipe; rich but healthy due to good fats from olive oil and walnuts. It comes from The Omega Diet. 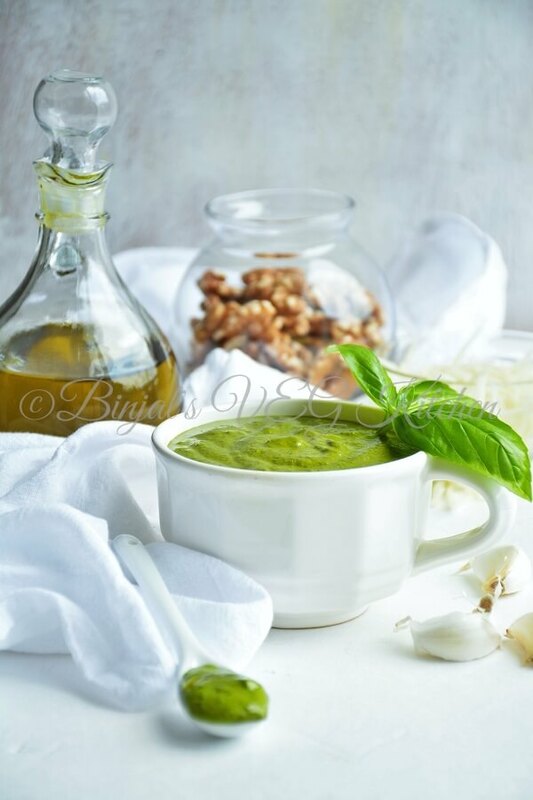 Basil Walnut Pesto is a Pasto, which is a sauce originating in Genoa in the Liguria region of northern Italy, and traditionally Basil Walnut Pesto consists of crushed garlic, basil, and European pine nuts or walnuts blended with olive oil and parmesan cheese. Pesto is traditionally prepared in a marble mortar with a wooden pestle. First, garlic and pine nuts are placed in the mortar and reduced to a cream, then the washed basil leaves are added with coarse salt and ground to a creamy consistency. Only then is a mix of Parmigiano-Reggiano and Pecorino added. To help incorporate the cheese a little extra-virgin olive oil is added. In a tight jar (or simply in an air-tight plastic container), covered by a layer of extra-virgin olive oil, pesto can last in the refrigerator up to a week, and can be frozen for later use. 1. Roast walnuts on a medium flame for 3-4 minutes, then keep aside. 2. Wash and drain the basil, then add into a food processor. 3. Add 3-4 garlic cloves, roasted walnuts, olive oil and salt. Blend the all ingredients and make the semi fine paste. 4. Add parmesan cheese, blend it again and make a smooth paste. 5. 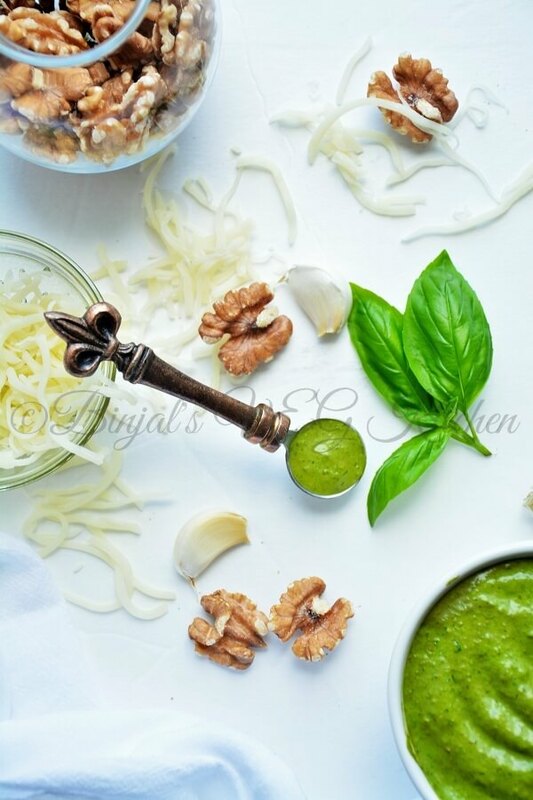 Basil Walnut Pesto is ready, use over the pasta or spread on the pizza as a sauce. • You can use pine nuts instead of walnuts. • You can add butter for richer taste. • You can add parsley for more greenish color. Roast walnuts on a medium flame for 3-4 minutes, then keep aside. Wash and drain the basil, then add into a food processor. Add 3-4 garlic cloves, roasted walnuts, olive oil and salt. Blend the all ingredients and make the semi fine paste. Add parmesan cheese, blend it again and make a smooth paste. 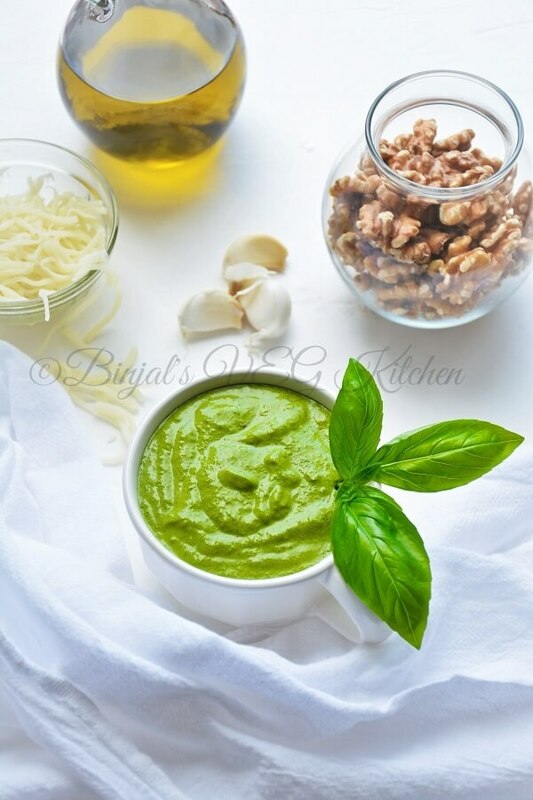 Basil Walnut Pesto is ready, use over the pasta or spread on the pizza as a sauce.